Carlos Tortolero was a high school teacher when he envisioned a museum of Mexican art. Now, 25 years later, the National Museum of Mexican Art in Chicago just celebrated its silver anniversary. But the museum offers more than a 7,000-piece collection by Mexican artists from both sides of the border. It also is a community center that has hosted concerts, literary readings by Sandra Cisneros, fundraisers for undocumented students, and even a wake for local artist Francisco Mendoza. The National Museum of Mexican Art is located in Pilsen on the near Southwest Side of Chicago. It was once an Eastern European area but over the last 30 years has become a majority Mexican neighborhood. Each year more than 160,000 people visit the museum from 60 different countries. They also receive visitors from every zip code in Chicago and are accredited, a designation that only 3 percent of museums, including the Guggenheim and the Whitney museums, also receive. But where this museum differs from many others is its emphasis on education. They have 12 staffers working in their education and arts programs, creating and connecting with the local community. Tortolero is just one of Chicago’s Latino community leaders working to champion culture and education in the Windy City. The Latino population is almost 30 percent in Chicago, according to 2010 U.S. Census data. The majority Latino group is Mexican, around 80 percent of Latinos statewide. But there also is a large Puerto Rican community, 9 percent statewide, and Central American, 4 percent statewide. More than 60 percent of Illinois Latinos live outside Chicago and one if five suburban Chicago residents is Latino, according to data from the Latino Policy Forum. The Latino youth population grew by over 30 percent in the last decade. Chicago and the suburbs are a port of entry for new arrivals but also home to a growing professional class of Latinos. One organization that has served the immigrant community in Chicago for more than 100 years is called the Gads Hill Center. In April 2012, the nonprofit celebrated its 114th anniversary. Maricela Garcia, a longtime community leader, was recently named their new chief executive officer. One of the main goals of this nonprofit is education and working with families. The center, also located in Pilsen, has day-care, early childhood education and after school programs. One of the challenges is supporting immigrant families where the parents do not have a high level of education. “The parents dream their children will do well. They work long hours but they don’t have the educational background to support the children,” Garcia said. She can relate to the stories of the immigrant parents, having come to the U.S. as a young woman from Guatemala and fled that country’s civil war in the 1980s. “It’s hard for youth to navigate when they grow up. It’s also about helping parents understand their children’s reality without letting go of values,” said Garcia. There is a strong family dynamic at this organization and many children start their programs in elementary school and continue through high school. As adults, many also come back as volunteers. Garcia told the story of a young woman who has participated in Gads Hill programs since elementary school. She graduated in May 2012 and this year plans to attend Brown University. She also won a Gates Millennium scholarship. “It’s these cases that make all the difference to how important our programs are,” Garcia said. 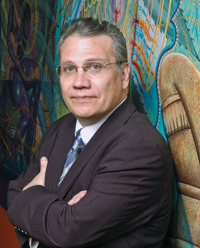 Oscar Chacon is the executive director of NALACC, or the National Alliance of Latin American & Caribbean Communities. His organization, founded in 2004, is dedicated to serving foreign-born Latinos. Of the Latino population in the United States, around 60 percent are native born and 40 percent are foreign-born. “We found there were no national Latino organizations put together to reflect the agenda and proposals of the foreign-born,” Chacon said. His alliance of more than 40 different organizations includes Mexican hometown clubs and Central American refugee organizations. “We are an advocacy voice at the national level,” Chacon said. Michael D. Rodriguez is the executive director of ENLACE Chicago, previously called the Little Village Development Corporation. He lives in the majority Mexican neighborhood called La Villita, a few blocks from the house where he grew up. “Little Village is the Mexican capital of the Midwest,” Rodriguez said. It’s a neighborhood that remains a port of entry for Mexican immigrants. More than half of the 80,000 residents in that neighborhood are under the age of 25. Still, despite the recession, the area is economically strong. There are more than 600 businesses and eight banks in a three-mile strip. “The entrepreneurial spirit is first class and really sustains the life of the neighborhood,” he said. Rodriguez works on a number of programs, including education, economic development, community enrichment and violence prevention. He organizes a food pantry, community gardens, plan for job creation and also work to stem violence caused by gangs in the area. For his work, Rodriguez was named a National Champion for Change in 2012 by President Obama for youth violence prevention. Another long-standing organization that focuses on education is the National Latino Education Institute. It was founded by Mary Gonzalez-Koenig in the 1970s and was then called the Spanish Coalition for Jobs. They lobbied and even boycotted companies that did not do enough to hire Latinos. “There were a lot of doors being closed for Latinos then,” said Elba Aranda-Suh, the current executive director. The organization boycotted Illinois Bell, the former telephone company. But today , its successor AT&T is a funder and a friend to the organization. And a former employee of Illinois Bell is now on their board of directors. In the early days, their training focused on things like typing and trades. Today they have various programs, including medical to business and technology.“We have graduates of our program who are now public officials, in media, medicine, law and in corporations,” Aranda-Suh said. “Our mission is to enhance education for Latinos.” And they have helped two and three generations of the same family. For Pepe Vargas, his community work has been about sharing diverse portraits of Latinos and Latin Americans on film. He is the founder and executive director of the Chicago Latino Film Festival. In April 2012, the festival hosted its 28th annual film festival with films from almost 20 countries, screened at more than a dozen venues and more than 35,000 tickets sold. This is a long way from the festival’s first year when they projected films on a concrete wall at a local college. Back then, 500 people came out. The 2012 festival included a film called La Otra Familia about a gay couple adopting a child in Mexico City. It was voted the audience favorite. The festival also showed films from Spain, including one made in Catalan. “We want to show a fair representation of the Latino diaspora,” Vargas said. Besides the theaters, they also show films at local colleges and at community centers. They also brought some of the films for free to students at Chicago Public Schools. The festival is now run by the International Latino Cultural Center. They also host a classical music festival each fall; now going on its seventh year. In the summer months they also show films in Chicago parks. Teresa Puente is a freelance journalist and a journalism professor at Columbia College Chicago.